Mushroom Corals are another sought out category for the display in a reef-type marine aquarium. Their vivid, vibrant colors can add significant visual value to your tank. Being quite hardy, simple to breed and feed, these corals are quite easy to maintain and therefore, a win-win buy for all, right from beginners to serious and experienced hobbyists. 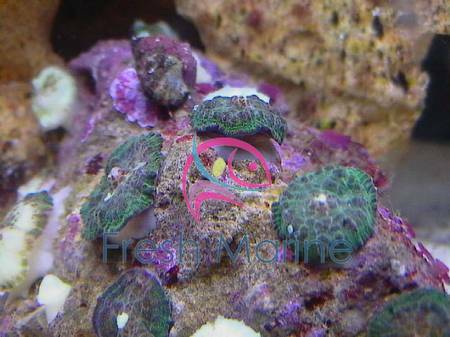 One such easy to maintain and a beautiful variety of Mushroom Corals are Bullseye Mushrooms. This article gives you an insight about the various dimensions of Bullseye Mushrooms. The information should come in handy in case you plan to introduce Bullseye Mushrooms in your marine aquarium or in case you already have one in. Other names: Bullseye Mushrooms belong to the Genus Discosoma and their scientific name is Discosoma species. Bullseye Mushrooms are also commonly known as Flower Corals, Mushroom Anemones and Disc Anemones. Coral Type: Bullseye Mushrooms are hard corals of Polyp type. Origin or natural range: Bullseye Mushrooms originate in the marine water bodies of a country, Tonga, in the continent Oceania. The country is an independent archipelago in the Southern Pacific Ocean. Size: Generally, small Bullseye Mushrooms are 1 inch to 2 inches long. Bullseye Mushrooms may however, vary in their sizes depending upon the depth of the marine water they are living in, the surrounding marine environment of the Discosoma species and the flow of water in the vicinity of Bullseye Mushrooms. Color: Bullseye Mushrooms are found in the color combinations of brown, red-green and purple-blue colors. Morphology: Bullseye Mushrooms are relatively quite hardy as compared to the other marine invertebrates belonging to the Family Cnidaria. Compatibility: Bullseye Mushrooms are relatively moderately aggressive in comparison to the other marine invertebrates. Breeding: Bullseye Mushrooms breed easily and rapidly in a marine aquarium. They propagate through vertical division called as longitudinal fission and each fragment then develops into a new Bullseye Mushroom. Temperature: The comfortable temperature range of your aquarium for the Bullseye Mushrooms is 72-78 degrees Fahrenheit. Specific gravity: The specific gravity of your marine aquarium�s water should be maintained between 1.023 and 1.025.
pH: Your reef aquarium�s water should have a pH of 8.10 to 8.40. Illumination: Bullseye Mushrooms require low illumination. In case you are using Metal Halides for illumination or intense light then, place the Discosoma species at the bottom of your marine aquarium till they adapt themselves to that degree of lighting condition. Water flow in the aquarium: Bullseye Mushrooms need low water movement. Marine aquarium habit & habitat: Bullseye Mushrooms are not lethally poisonous in nature. The Discosoma species spread rapidly and therefore give them ample space in your reef aquarium. Feeding: Bullseye Mushrooms are photosynthetic in nature owing to their symbiotic ecological association with photosynthetic algae, zooxanthellae. The alga lives within Bullseye Mushrooms. The Discosoma species also feed upon marine acellular planktons both, phytoplankton and zooplankton, and frozen meaty bits. Add Iodine and trace elements to your marine aquarium�s water as supplementary nutrients for the Bullseye Mushrooms in it. Care: Bullseye Mushrooms are easy to maintain. They can be comfortably managed in a regular reef-type marine aquarium. Bullseye Mushrooms are an attractive proposition for your marine aquarium. Also, their ease of maintenance makes them true value for money. So, take all those doubts out of your mind and go ahead to adorn your tank with Mushroom Corals. Happy mushrooming!